Railroads and trains have been a major part of life here in Thomson, Illinois since the 1800’s, and just a walk around town will convince you that this little community is steeped in railroad tradition. 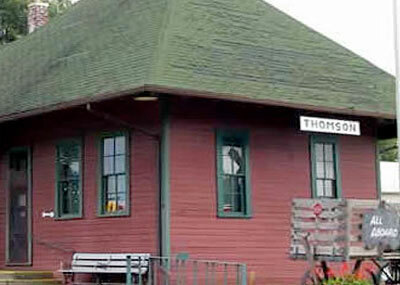 So, it’s not a surprise that the Thomson Historical Society set up shop in the old Train Depot that sits along the tracks going through town. With its unique wooden depot fully restored, this old Depot contains railroad memorabilia and museum of York Township pioneer life. The Depot is open Saturdays and Sundays from May to September, and it is located on Main Street in Thomson, right along the Railroad tracks. This is a good place to spend an afternoon.